It wasn’t exactly pretty and it was definitely a little harder than expected. But a win is a win, and in Game 5 of the Japan Series, you take them any way you can get them. 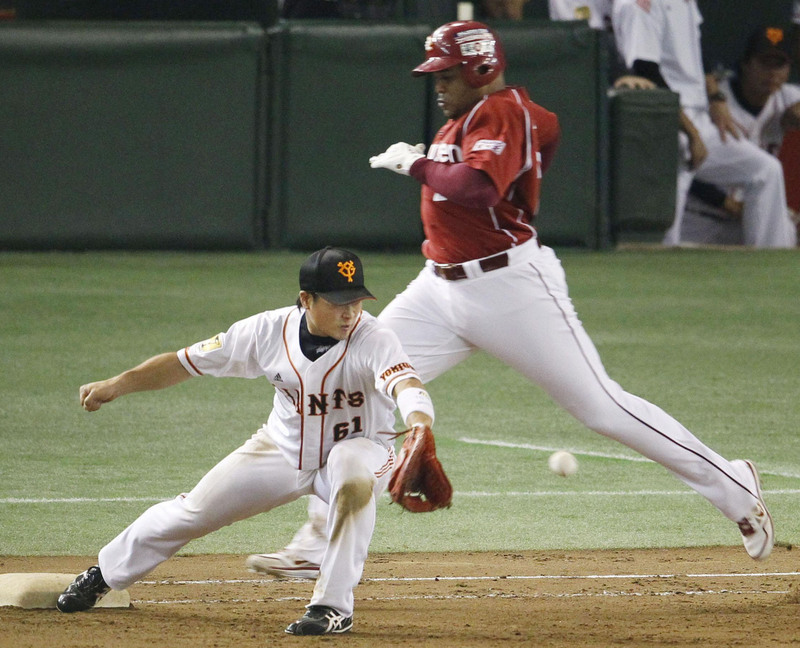 The Tohoku Rakuten Golden Eagles lost the lead in the bottom of the ninth, took it back on Ginji Akaminai’s RBI single in the 10th, and got an insurance run on Andruw Jones’ infield RBI single later in the frame to edge the Yomiuri Giants 4-2 on Thursday night at Tokyo Dome. The Eagles now lead the series 3-2 and get two chances to clinch their first-ever title at home in Kleenex Stadium, with undefeated ace Masahiro Tanaka (26-0 in 2013, including the postseason) waiting in the wings to start either Game 6 or a potential Game 7. “We’re in the driver’s seat now; one game up and going to Sendai to win it all for the home fans,” Hoshino said. 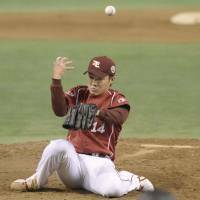 Rakuten pitcher Takahiro Norimoto blew a possible four-inning save by giving up a game-tying run in the bottom of the ninth. Norimoto later led off the top of the 10th and drew a walk to start the frame. 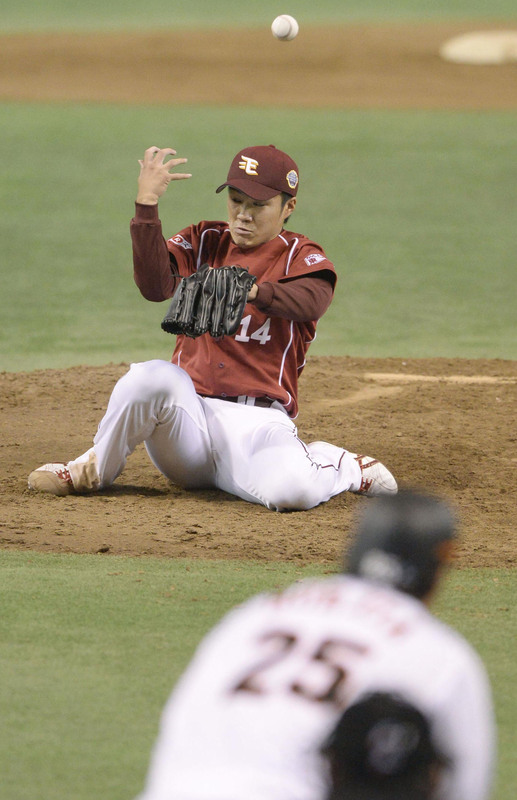 He went to second on a sacrifice bunt by Takero Okajima, and the Eagles added another baserunner when Kazuya Fujita was hit in the calf with a pitch from Giants reliever Kentaro Nishimura. Norimoto came around to score the go-ahead run on Akaminai’s one-out single to give the Eagles a 3-2 lead. “I felt good coming into the batter’s box with two runners on and just wanted to get a hit and put us ahead again,” Akaminai said. 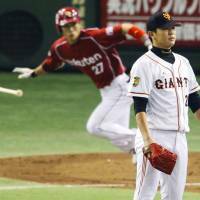 Fujita went from first to third on the play, but the pain of being hit became too great as he was lifted for a pinch runner, Toshito Abe. Jones then legged out a two-out infield single (on a play at first that could’ve been called either way) which allowed Abe to score and put the Eagles ahead 4-2. “I smelled it when I saw the third baseman kind of lose the ball in the lights,” Jones said. “So I thought I had a good chance. So I just kind of put a little step on that, trying to get that extra run. It must have worked, because the rookie took the mound in the bottom half of the inning and retired the side to record the win. “It was tough pitching in the ninth after I gave up the leadoff double to (Yoshinobu) Takahashi, but I thank the manager for staying with me to pitch the 10th and get the win,” Norimoto said. 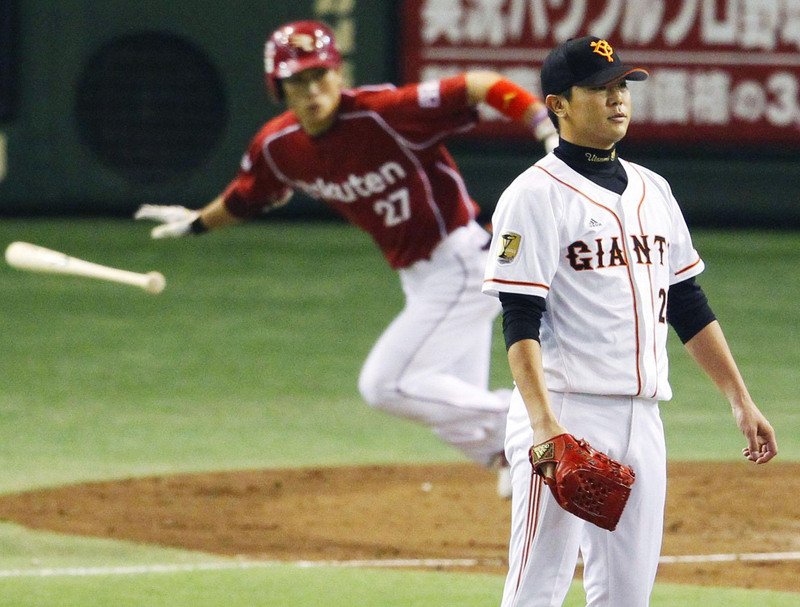 Rakuten nearly won the game in nine innings, thanks to the combined efforts of starter Wataru Karashima and Norimoto. Twenty-three year-old Karashima did a good job of mixing his pitches and never faced any real danger in his five innings on the mound. Karashima, a fourth-year pro out of Izuki High School in Fukuoka Prefecture, didn’t give up his first hit until Daisuke Nakai lined a single into center with one away in the fifth. The left-hander struck out four and walked a pair, allowing just Nakai’s hit before giving way to Norimoto. Norimoto took home the victory after blowing the save, allowing a pair of runs and striking out five over five innings. The rookie was the losing pitcher in Game 1 despite eight solid innings of two-run ball and came back on short rest on Thursday. “I’m very tired, but our starter Karashima did a terrific job, and I’m glad I was able to relieve him and get us to the finish line as the victors,” he said. Nishimura was charged with the loss. The Giants head to Sendai with their backs against the wall, needing to win two games in order to repeat as Japan Series champions. Shuichi Murata continued to terrorize Norimoto, especially fitting on Halloween, homering in the seventh and hitting an RBI infield single off the right-hander’s glove in the ninth. 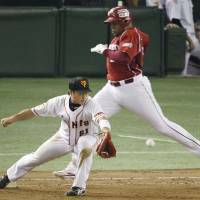 He also went deep off Norimoto in Game 1. Murata finished with half of the hits on another poor night at the plate by the Kyojin, who have been out-hit in all five games. Yomiuri continued to get almost no production out of mainstays Hayato Sakamoto and Shinnosuke Abe. Sakamoto was 0-for-3 with three strikeouts and is 2-for-17 for the series. Reigning CL MVP Abe, who hit .296 during the regular season, also went hitless in Game 5 and is just 1-for-14 at the plate overall. Even Yomiuri’s most dependable hitters in this series, Hisayoshi Chono (6-for-15 with four RBIs through the first four games) and Takayuki Terauchi (4-for-14 with two RBIs in the same span) lost their way in Game 5, combining to go 0-for-7. The scene shifts to Sendai for Saturday’s Game 6, where the Eagles will be trying to close it out.